Establishing the first ethanol plant in the “Show-Me State” was a hard sell, but a very strategic and significant one. Pegged unofficially as the “Show-Me State,” Missiourians are known for their stalwart, conservative and noncredulous nature. John Eggleston knows this all too well. 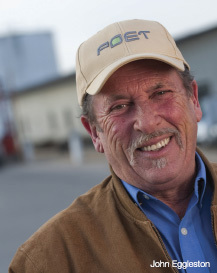 While attempting to start Missouri’s first ethanol plant in the late 1990s, he spent five years encountering and overcoming those native characteristics. And farmers weren’t the only skeptical Missourians. But Eggleston and Gamm, too, are from Missouri. “The more we found out we couldn’t get it done, the more we felt we were going to get it done! I don’t know if you call that persistence or stupidity,” chuckles Eggleston. But to get it done, the board had to re-invent their original plans on multiple counts. The venture had started out to be a farmer-owned cooperative, but the board found it “absolutely impossible” to raise the needed funds under that arrangement. So the first change was in corporate structure. An LLC was formed in order to be able to attract additional outside investment. (Both corporate forms have continued to this day, with two partially-overlapping boards at Macon — a co-op, Northeast Missouri Grain Processors, Inc., and a limited liability corporation, which is now known as POET Biorefining – Macon, LLC). With the LLC change, investment increased, but still short of the goal. So the scope of the project was scaled back, in both finances and plant size. Originally slated to be a 25 million gallon plant, plans were revised downward to 15 million gallons, although with built-in capabilities for expansion. It was also about this time that Eggleston, in Washington D.C. with the Missouri Corn Growers Association, had a chance meeting with Jeff Broin. Soon afterward, he gave the young ethanol entrepreneur a call. Eggleston, 61, who farms 1,200 acres of corn and soybeans with his brother Stan near Memphis, Mo., credits fellow board members for their vision, dedication, and tenacity in seeing the project through to fruition. However, Eggleston and Gamm affirm that the result was worth it. “Doing something that’s never been done before was a lot of hard work, but it was also a lot of fun,” smiles Gamm, 81, a semi-retired farmer from Ewing, Mo. In the nine years since it started, the facility has continued to be very productive, and has given its owners a tremendous return on their investment. It has been one of the best in retaining employees, growing managers and has helped blaze a trail for five other ethanol plants in Missouri. The Macon plant began grinding its first load of corn to make ethanol in May of 2000. Shortly after the first week it was producing at its 15-million gallon nameplate capacity, and very quickly blew well past that to run at a 20, 22 then 23 million gallon per year rate. “We saw right away that this plant would run, and run hard,” says General Manager Steve Burnett, who said that the decision was made almost immediately to expand to a 36 million gallon nameplate capacity. This time it only took one year to raise the needed capital. After a one-year expansion project with very few days of lost production, the newly-expanded facility began producing at the expanded nameplate in April 2003. Again, nameplate capacity was met almost immediately, then exceeded. Ethanol production today stands at an impressive 46 million gallons per year, in addition to the production of Dakota Gold® dried distillers grains with solubles (DDGS) and carbon dioxide. Burnett, who described being able to hire all of the original employees himself as a “breath of fresh air,” credits his team’s performance for the plant’s track record. Burnett recites some stats that speak to the quality of that initial group: of the 27 original hires,14 still work at Macon; of those, five who started as hourly employees are now on his management team and four others have gone on to management positions in other POET plants in Missouri and Iowa. However Burnett, a native Texan, a people person and a man of faith, is most proud of the working relationships within the plant’s team. Other veteran Macon managers offer their personal perspectives of the facility’s atmosphere. “This is a great place to work,” says Commodities Manager Matt Gerhold, who grew up in the area. Despite being one of POET’s (and the nation’s) older ethanol plants at the ripe old age of 9, the facility still runs at well above nameplate. It also remains one of POET’s consistent winners in the least amount of plant downtime. Future planned upgrades to add POET’s BPX™ technology will make the Macon facility even more efficient, and cellulosic production capabilities may be added when that technology is commercialized and ready for implementation. The POET Biorefining – Macon guest list has included U.S. congressmen and senators, Missouri’s governor and gubernatorial candidates, the state director of agriculture, other political candidates, an annual state Professional Women in Leadership Challenge tour and generally about anyone who will listen to the ethanol story. One key group the Macon people have focused on is newly-elected state legislators. The Macon plant regularly hosts a stop on a statewide tour of incoming state representatives and senators, many from the state’s urban areas who have never set foot in a corn field or ethanol plant, and whose knowledge of ethanol has come from what they’ve heard in the media. Eggleston and Burnett feel that the efforts have paid some very productive dividends. At least partially as a result of the Macon group telling their story and being politically active, the state now has six ethanol plants, including a second POET plant at Laddonia. A Missouri Renewable Fuels Association was formed in 2006 (with Eggleston as the inaugural president) to represent all ethanol companies in the state with a united voice. This group has in turn worked with the state legislature to enact tax credits to spur individual investment and incentivize ethanol producers. And in January of 2008, the legislature instituted one of the nation’s few state renewable fuels standards, requiring a 10 percent ethanol blend for all gasoline sold in Missouri. Still, the need to tell the story goes on. Darcy Anderson started working as an administrative assistant at POET Biorefining – Macon in April of 2000, about a month before production started. Fresh out of college with a B.S. in business management, it didn’t take her long to figure out she had a good opportunity. “In the first few months after I started, I could see that there was potential for me to grow with POET,” says Darcy. With the help of a POET tuition assistance plan, she promptly enrolled in a night MBA program through William Woods University at a satellite site in nearby Moberly, Mo. During her studies, Anderson experienced what could be described as a “co-product” of her academic endeavors. Anderson graduated in August of 2002, and was soon promoted to staff accountant. Then in 2006, she was promoted to plant controller. During that time, Darcy and husband Billy (who is currently a maintenance intern at the Macon plant) became the parents of two daughters. She has a very busy life, but is pleased with her career and her decision to get more education. POET Biorefining – Macon has not only established an enviable track record in producing ethanol, but also in producing leaders. Four individuals, who were originally hired by Steve Burnett as hourly team members, have moved to significant management responsibilities in other POET plants. Andrea Carpenter, who began at Macon as a Lab Technician is now the Lab Manager at POET’s biorefinery at Laddonia, Mo. Also at Laddonia are Maintenance Manager Chris Richison, who was a Maintenance Coordinator at Macon, and Commodity Manager Kyle Samp, who began at Macon as a college intern. Kyle’s brother Andrew Samp is the Operations Manager at POET’s biorefinery in Jewell, Ia. He originally started at Macon as a Night Operator. 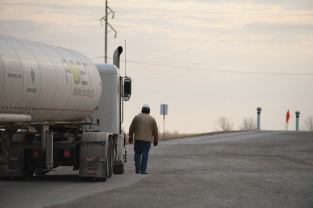 EPA Issues Proposed Rule to Lift E15 Restrictions: What Does It Mean for Air Quality?